I’ve switched to a standing desk for work, and thought I’d share my experiences with it. I tend to get involved in a variety of things at work, but I’m primarily a developer. I’m a code monkey. Traditionally, this has involved a lot of sitting. Not just a lot of sitting overall, but for long periods, too. I couldn’t tell you the number of times that I’ve been hunched over a laptop and lost track of time… looking up in surprise hours later. There has been a lot of press about how bad this is for me. Excessive sitting is lethal. Sitting for an hour does more to shorten your life than smoking a cigarette. I figured that as long as I went for a run and kept my weight down, that would make up for it. There is also research that says this doesn’t work and that sitting causes harm which isn’t undone by a bit of exercise every day. I’d ignored more or less all of this. But then I screwed up my back and sitting for long periods wasn’t an option. 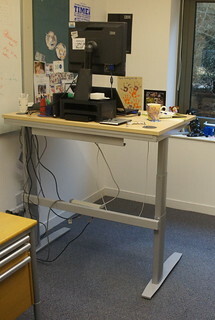 Working on a standing desk started as a necessity, but now that I’ve gotten into it, I wish I’d started years ago. I don’t want to sound like a zealot or try to convert people to it. I just want to share what it’s been like.